At the J. Paul Getty Museum, "Gods of Angkor: Bronzes from the National Museum of Cambodia" is a very small show on a very large subject. For a viewer, its primary achievement is to make you want to see more. The Khmer Empire was born in 802, when a Hindu monarch, Jayavarman II, declared himself a god and established his seat of power in Angkor in the northern reaches of what is today Cambodia. The city grew to be immense, among the largest cities in the world, with a sphere of influence that encompassed a large chunk of modern-day Southeast Asia, including Thailand, Laos and Vietnam. The empire lasted more than 600 years -- nearly until the birth of Columbus. Say the word Khmer today, however, and visions of horrific crimes against humanity perpetrated in the 1970s civil war by the brutal Communist leader Pol Pot still linger. "Gods of Angkor" evokes an entirely different world. Among the show's most impressive works is a 12th-century "Crowned Buddha," with upper arms held close to the ramrod-straight torso, forearms raised forward from the body and open palms held up. Even to the uninitiated, this formal, highly ritualized pose presents a thoroughly unprotected gesture that demonstrably offers peace. 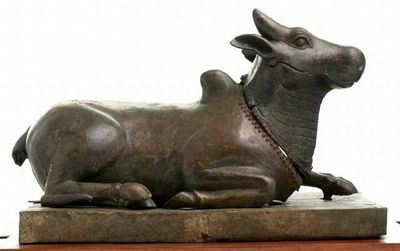 Nearly 3 feet tall, the cast-bronze sculpture is less ornate than a Chinese counterpart might be. Still, the exquisite ornamentation sets the figure apart from an everyday human being. Erect and symmetrical, its head, throat and waist encircled with elaborately modeled jewelry, the serenely smiling Buddha speaks of dignity, eternity and unostentatious majesty. A human form assumes an otherworldly presence. Khmer sculpture registers as an obviously complex subject -- produced over half a millennium, influenced by powerful crosscurrents from India and China and responding to compelling varieties of Hindu, Buddhist and secular forces. Also complex is the treacherous process of lost-wax casting in bronze. The technically arduous method can result in sleek objects with a spirit very different, and often more elegant and stately, than the carved sandstone Khmer sculpture that is more commonly encountered. Typical, however, and evident in the majority of the show's sculptures, is the straight, columnar modeling of the figures' legs. Feet face forward and are separated in a firm stance that conveys stability more than rigidity. It's unusual for a divine Khmer sculpture to stand in a posture that reveals the slightest sense of ordinary bodily relaxation. Any one of the many technical demands of bronze casting is unlikely to explain this standard design. Instead, it draws a subtle distinction between a mundane person, who would not be memorialized in expensive bronze, and a deity who warrants such noble and enduring treatment. It's almost as if the formality of the deity's posture creates a portal to another dimension. Also imposing are two very different sculptures that find their considerable strength and charm in close observation of nature -- specifically the animal kingdom. One is Nandin, the decorated bull that serves as Shiva's primary vehicle and the gatekeeper of his temple. The other is Ganesha, Shiva's elephant-headed son. Perhaps because both animals are already differentiated from a person, each is endowed with a more relaxed naturalism. The Getty show was organized by the Smithsonian Institution's Arthur M. Sackler Gallery, where it had its debut last spring. (Former Getty Museum Director Michael Brand, a specialist in Southeast Asian art, helped initiate the exhibition.) One drawback of its installation here is that most of the objects are in cases or on pedestals that stand against the walls. The sculptures are typically frontal, in keeping with their ritual function; but you can't get behind the "Crowned Buddha," for instance, to see the modeling in the back. That's a shame. The show was also significantly trimmed from its Washington debut. Mostly works from the prehistoric and pre-Angkor period were cut. Twenty-six of the show's original 36 bronzes are at the Getty. The sculptures and decorative objects were loaned from the incomparable holdings of the National Museum of Cambodia in Phnom Penh, signaling something of a return from the dark and insular days of the Khmer Rouge a generation ago. 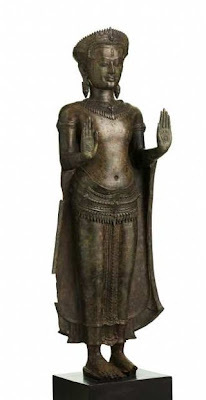 If it inspires a desire to see more Cambodian bronzes of the Angkor period (802-1431), two nearby options are at hand. The most impressive collection is at Pasadena's Norton Simon Museum, where nine Cambodian bronzes are among more than two dozen Angkor period and pre-Angkor objects. The Los Angeles County Museum of Art has six small decorative bronzes in its collection, including jewelry and a finial. For comparison, both museums also house impressive Cambodian sandstone carvings.